Cathal Pendred is the reigning Cage Warriors FC Welterweight Champion and is likely the next Irish fighter to make the step up to the UFC. Pendred grew up playing rugby throughout his youth. Despite being one of the bigger guys and participating on one of the top amateur teams, Pendred never went pro. Instead, he ended up traveling to San Diego for a short stint where tried out MMA for the first time. Pendred was addicted and he soon poured everything he had into becoming one of the top fighters in Europe. Pendred turned pro in 2009, winning his first pro fight before deciding to drop down to Welterweight. Pendred struggled with his weight cut and ended up losing via submission. Pendred rebounded by winning his next 4 fights, raising his overall record to 5-1. Pendred signed on with Cage Warriors FC in 2010, winning his debut. Just a week later, Pendred stepped into the cage on short notice against a much more experienced Lee Chadwick. The fight took place at Middleweight, and Pendred paid the price, losing via 1st round TKO. Pendred slowed down his pace a bit and the wins soon followed. He built up his record to 9-2-1, which finally started to gain him some traction on the European fight scene. Pendred officially put himself on the map by defeating UFC veteran David Bielkheden via decision in 2012. He followed that up with an upset victory over submission expert Bruno Carvalho, which ultimately earned him a shot at the Cage Warriors FC Welterweight Championship. Pendred faced recently crowned champion Gael Grimaud, who was fresh off a submission win over UFC veteran Jesse Taylor. It was a back and forth war of attrition, but Pendred was able to walk out with his hand raised and the title wrapped around his waist. Pendred’s rise continued as he defended his title later that year against recently released UFC vet Che Mills. Mills missed weight for the fight, turning it into a non-title affair, and after 3 rounds of Pendred’s wrestling dominance, the fight was stopped via TKO. Pendred trains out of SBG Ireland, which is also home to burgeoning UFC Featherweight star Conor McGregor and rising prospects Chris Fields and Patrick Holohan. SBG Ireland has a strong buzz around it thanks to McGregor and the camp’s recent success in the Cage Warriors promotion. Pendred has also been recently training with UFC Welterweight Gunnar Nelson, which is exactly the type of style of fighter Pendred needs to embody . If Pendred can develop some type of submission game from the top, he could one day be a future contender. With the UFC possibly exploring a return to Ireland in 2014, Pendred seems to be a lock for a possible spot on the fight card. Cathal Pendred has a very different style than his teammate Conor McGregor, so there shouldn’t be any comparisons made based off McGregor’s meteoric rise in the sport. Pendred has a very conservative, grinding, wrestling-based style that will likely not lead to many Fight of the Night awards. Yet, mixed in with his conservative approach is a rare hard-nosed approach towards winning. We see a lot of top-level fighters trying to win off points instead of doing everything in their power to finish a fight. In Pendred’s case he does win most of his fights via decision, he is always pushing forward and using what limited skills he has towards working for the finish. If Pendred has an achilles heel, it is that his overall finishing skills are severely lacking. While striking, he has a decent right hand, but he is very stiff and won’t win many fights if he can’t bring things to the ground. He has a developing top game that is starting to turn the corner, but he still struggles with his submissions and needs to start incorporating more elbows. Pendred is a huge Welterweight. At 6’2, he would be one of the Top 5 tallest fighters in the UFC Welterweight Division. Beyond being just tall though, Pendred carries a ton of muscle on him, which truly makes him a very dangerous fighter in the clinch. Pendred loves to bully his opponents up against the cage where he uses his strength advantage in the clinch to bring things to the ground. His style is somewhat similar to Jake Shields, but without the top-level Jiu-Jitsu. 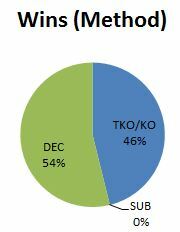 As mentioned though, Pendred makes up for his lack of finishing skills with an absolute drive to win. After watching Pendred fight, there is no questioning Pendred’s will to succeed. If there is one thing Pendred and McGregor share, it is that type of mentality. Looking across the UFC’s Welterweight division, I truly see Pendred finding legitimate success in the UFC. He is steadily improving his overall skill level by training with Gunnar Nelson and Conor McGregor, and at 25 years old, he still has time on his side. Pendred’s striking will eventually stop him from becoming a Top 10 Welterweight, but I see him having a relatively decent chance at becoming a Top 25 fighter and another force hailing from Ireland’s rising fight scene.